Your Physician has numerous options for treatment of arthritis complaints. These options include conservative modalities and some are listed below. Many options are have been proposed those with scientific data and those by consumer hearsay. Some of these are noted below. 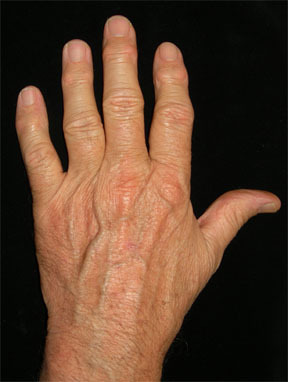 Example of a hand with arthritis and redness and swelling about the knuckles. 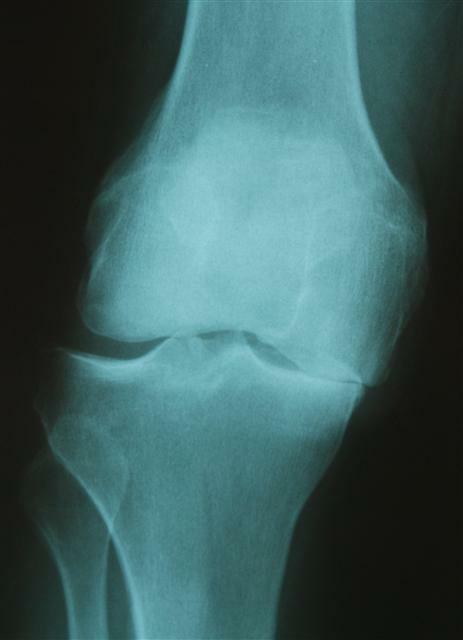 This is an example of knee arthritis showing the decrease space on one side of the knee compared to the other side. This can be used to strengthen the muscles around the joints so they can be better supported. Muscle weakness alone can cause a joint to have pain. Most patients can learn the exercises and then do them at home, but like anything they must do them to get results. 3. Tylenol is a pain medication with ability to avoid some or the above risks, but one should be careful of the dosage here as to avoid potential liver problems. 4. Cortisone injections are a way to directly decrease the inflammatory process in a joint, but may not be used routinely. Again as with all medicines there are reactions to this as well including localized pain, swelling, and elevation of glucose(sugars). There are other associated reactions as outlined in the PDR. 5. Pain Medication: this would very rarely be used as a first line choice as there are reactions and a risk of dependency. 6. Proper Foot Mechanics: sometimes just the nature of our feet can lead to problems higher up in the body, an example is that bad or the so called flat feet may make the ankles and knees etc. hurt. Shoe modifications or orthotic inserts may be of a benefit.